In an age where superhero origin stories have been done and redone way too many times – I’m looking at you, Spider-Man – Captain Marvel manages a fresh take on the genre without giving up any of the tropes fans have loved since the early days. Captain Marvel (played by Brie Larson), also known by her civilian name Carol Danvers, is a “noble warrior hero”, which is how Kree warriors describe themselves. Between training lessons and snarky comments, we learn that besides being an incredible fighter, she can blast power from her hands. Yes, her power is literally to project energy blasts from her hands. After seeing her in action, it is not hard to understand why Marvel Studios president Kevin Feige called her “the strongest character we’ve ever had”. A recurring point in the movie focuses on what is considered her biggest weakness: emotion. It is a stark contrast to the mentality of previous Marvel Cinematic Universe (MCU) movies, which counted on their heroes to use emotion to balance out their power. We know little more about Danvers than her supernatural abilities for the most part of the movie, due to unexplained memory loss. This is like her comic book counterpart, who has lost her memory many times. Following the trend set by Thor: Ragnarok, Captain Marvel uses comedy to cut through serious moments. Danvers has a witty sense of humour, which goes unappreciated by her Kree companions but shines when she touches ground on Earth. Larson was the perfect choice for portraying the hero, with a captivating smile that delivers jokes perfectly while still taking on the more challenging parts of the role. Overall, the movie’s stakes are not really high and the audience knows it. Being set in the past, it is decades behind the current events in the MCU and the movie does not try to pass any danger as a world-ending situation. It’s a refreshing take, specially after the events of Infinity War. But this does not take away from the soul of the movie, which has many heartfelt moments that make Captain Marvel more relatable to its viewers. In the comic books, Carol Danvers is an officer in the United States Air Force who becomes half-Kree after fusing her blood with Mar-Vell, the original Captain Marvel. Both in the movie and comics, the Kree are a militaristic alien race that look like humans with blue skin. No, Danvers’ skin does not turn blue when she becomes half-Kree but her blood does, as we see in the opening shot of the movie. MCU fans are no strangers to the Kree, who were the main villains in Guardians of the Galaxy. The villains this time are their long time foes, the Skrull, alien shape-shifters who can transform into any person they have seen. Captain Marvel is joined by many well known and loved characters from the MCU, including a young Nick Fury (Samuel L. Jackson). With the (occasional) smile on his face and without his characteristic eyepatch, this Fury is nothing like the one we’re used to. Young Fury, who uses a baby voice when talking to a cat, could not be any further from the angry S.H.I.E.L.D. agent we know from previous movies. Both Fury and Agent Coulson (Clark Gregg) appear much younger, achieved through CGI. This is not the first time Marvel has “un-aged” actors, the most recent being Michael Douglas as a young Hank Pym in scenes of Ant-Man. Also “un-aged” was the city of Los Angeles, with the movie being set in the early 90s. From Danvers falling through a Blockbuster roof, to buying communication equipment from a Radio Shack, nostalgia was in the air. I never knew how much I needed to see Nick Fury driving down a desert road blasting Waterfalls by TLC until it happened, but it changed my life. As Guardians of the Galaxy explored 70s and 80s music, Captain Marvel put together an incredible homage to the best of the 90s. This was the first Marvel Studios movie released since Stan Lee’s death and it paid a beautiful tribute to the man who elevated Marvel Comics to the powerhouse it is today. Lee, who passed away in November 2018, created some of Marvel’s best known characters, such as Spider-Man, the Hulk and Thor. The traditional stills from previous movies, which are usually part of MCU movies’ opening credits, were substituted by photos of Stan the Man, followed by a black screen saying ‘thank you Stan’. It wasn’t until later in the movie that Lee himself appeared in one of his famous cameos earning a soft smile from Captain Marvel that meant so much more to fans after his passing. 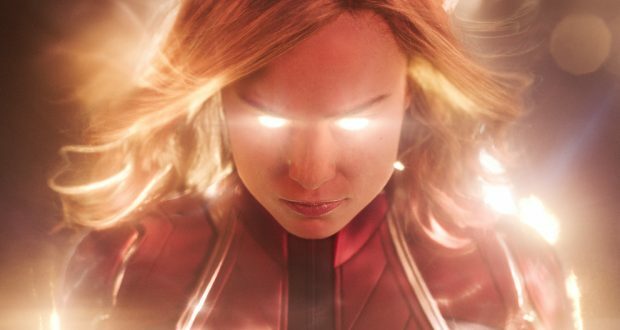 Altogether, Captain Marvel was the necessary first step to Marvel’s introduction of more female led movies. It will not be nominated for an Oscar, like Black Panther was, but it will give a strong role model for young girls everywhere and that’s good enough for me. And don’t forget to stay for the after-credits scene, you might see a familiar face or two.